Recovery isn’t an easy process. Jogi Low began working his 12 steps after the World Cup debacle. At first it went smoothly. He admitted he was powerless over football’s changing nature, that the German squad who won the 2014 World Cup in Brazil became unmanageable in Russia 2018. He came to believe other tactical methods could be greater and more powerful than his and committed to giving himself over to those methods. He undertook a searching, moral self-inventory and, other than the Mesut Ozil controversy, admitted the nature of his wrongs. After preparing to confess his sins before the press, he humbly asked their forbearance, if not their forgiveness. So far, so good. Unfortunately, when it came to making a list of all the people he had harmed and attempting to make amends when it would cause no harm to others, the process became muddled. Seeking to set matters aright, he jetted down to Munich before the international break, stopping in at the Allianz Arena to inform Bayern and Die Mannschaft stars Jerome Boateng, Mats Hummels and Thomas Muller that their international services were no longer required. That had to do some harm, especially considering goalkeeper Manuel Neuer, arguably the weakest link in Germany’s Russian travesty, wasn’t included in the meeting even though he was on the property. Neuer’s job was safe, which didn’t do much to assuage Marc-Andre ter Stegen. A visit to the Camp Nou to apologise for benching Ter Stegen seems more appropriate. The Barcelona No.1 flawlessly backstopped Germany through qualifying, playing out from the back as masterfully as the original sweeper keeper, making critical saves, marshalling his defence. In mid-June, however, there was no place for him. Low went with Neuer before he was fully recovered and match fit. The latter doesn’t matter for keepers when it comes to endurance but is critical for timing and instincts. With Ter Stegen between the sticks, a key save here, a precise pass there, a commanding challenge between, might have lifted the sluggish champions into the knockout stages which they had only failed to reach once  in 19 previous World Cups. For all that, a trip to Manchester would have amended an even greater wrong. Winger Leroy Sane was left off the World Cup squad entirely despite performing exceptionally well for Manchester City during their title run. The 22-year-old produced ten Premier League goals and 15 assists in 32 matches, 14 and 19 across all competitions in 49. Sane didn’t take the snub well, allowing it to affect his club performance. When this season began, he found himself on the bench for the first three league matches and out of the squad for the fourth. Given an opportunity in September, he did what he does best and ran with it. Through 25 PL tilts, the left winger tallies eight goals and ten assists. He’s at 14 and 17 overall, on the verge of surpassing last season’s mark. He is what every manager should want in an attacking player. His pace leaves defenders pulling out their cell phones and accessing their Uber app. His dribbling causes them to put their therapists on speed dial. He penetrates the box from either flank, racing to the end line or cutting across the top of the box. When he draws multiple defenders, he finds an open teammate. When instead he finds a half-yard of space the far corner bulges and sports psychologists add goalkeepers to their client lists. Low didn’t want him in Russia. He paid the price. With Sane now in the squad, Germany again fields an attack to be feared. During a sluggish first half against Serbia last week, he was the liveliest player. When Marco Reus and Leon Goretzka came on in the second half, the trio fed off one another, levelling terms. Sane was such a terror, Milan Pavkov couldn’t wait to seek counselling. He took the City winger out three minutes into stoppage time, earning a straight red card. The Red Star Belgrade striker had only been on the pitch for 22 minutes but spent most of it watching teammates made to look silly by Sane. Fortunate not to be severely damaged by Pavkov’s brutal tackle, Sane picked up where he left off against the Netherlands in his country’s opening Euro qualifier. After making several forays from the left flank, he took route one on a counterattack at the quarter-hour, opening space along the touchline for Nico Schulz. The Hoffenheim left-back drove all the way down the pitch before delivering a perfect short cross for Sane to thunder home. Serge Gnabry added a second just after the half-hour. Matthijs de Ligt and Memphis Depay drew the Dutch level early in the second half before Schulz found the winner, unmarked upon arriving late in the box just into added time. Throughout, however, Sane ran rampant. 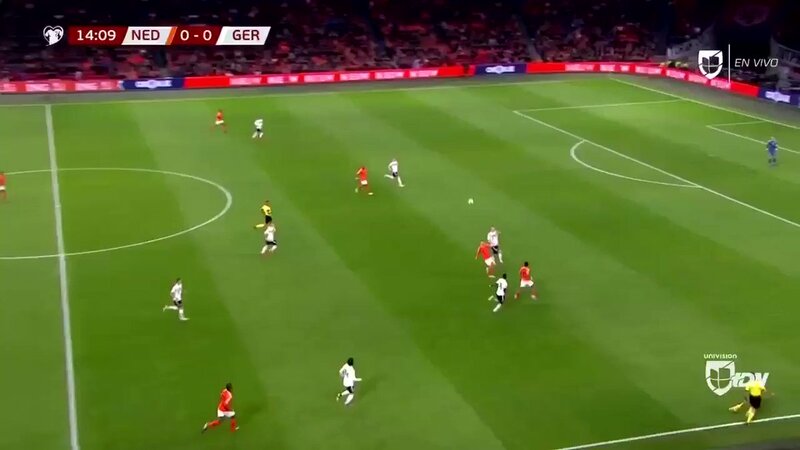 Jogi Low may struggle when redressing past mistakes, but starting Leroy Sane on die Mannchaft’s left attack flank is all the amending that the Premier League star requires. Sadly, there is no avoiding the harm it does to others.